The Blue Room is decorated in shades of pale blue, giving a feel of a room which is light and airy. 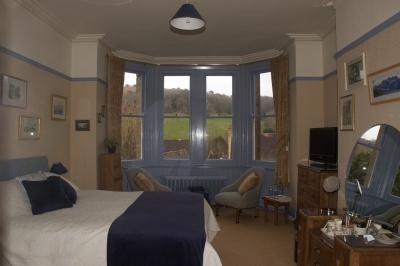 Overlooking the garden, the room sleeps two in a king sized bed, which can be split into two singles if required. The spacious private bathroom is immediately next door with walk in shower and low level bath. For more photos of the Blue Room see the Galleries page.